Professor Eduard Feireisl received the prestigious Neuron Award for Contribution to Science awarded on 1st December 2015 by the Neuron Foundation for Support of Science. He is a worldwide renown specialist in mathematical theory of fluid dynamics whose expertise has been credited by the prestigious ERC Advanced Grant MATHEF. We are proud that after Miroslav Fiedler and Ivo Babuška this is already the third Neuron Award for a researcher who is or used to be member of the Institute of Mathematics CAS. With a deep sorrow we inform that Professor Miroslav Fiedler, researcher emeritus in the Institute of Mathematics of the Czech Academy of Sciences, member of the Learned Society of the Czech Republic and Honorary Member of the Union of Czech Mathematicians and Physicists passed away peacefully at his home in the morning of 20th November 2015. Below is a link to the Memorial page with contributions of friends and colleagues. Further contributions are welcome. They should be sent to the address mathinst@math.cas.cz. The quadrennial top scientific event of the European Mathematical Society is organized by the German Mathematical Society (DMV), the International Association of Applied Mathematics and Mechanics (GAMM), the Research Center Matheon, the Einstein Center ECMath and the Berlin Mathematical School (BMS). For further information about the programme, registration, grants and many accompanying activities visit the congress web site. The multidisciplinary summer school devoted to graduate students, young scientists, and other interested specialists will consist of series of invited lectures on various aspects of problems related to pressure and its role in mathematical analysis and numerical simulation of various types of flows. Organizers: Tomáš Bodnár (Czech Technical University in Prague), Giovanni Paolo Galdi (University of Pittsburgh), Šárka Nečasová (Institute of Mathematics CAS in Prague). Special lecture: Monday 29th August, 4:10pm - 5:00pm, Prof. Ernest Roetman: AN ENGINEERING MATHEMATICIAN - a presentation about his works at Boeing - the Military Airplane Division. Further details and registration: http://www.prague-sum.com/. Lectures will be given by: Bernard Dacorogna (EPFL, Switzerland), Anne-Laure Dalibard (École Normale Supérieur, France), Igor Kukavica (USC Dornsife, USA), Franck Merle (Université de Cergy-Pontoise, France), Gigliola Staffilani (MIT, USA) and Andrew Stuart (University of Warwick, Great Britain). President of the Academy of Sciences Prof. Jiří Drahoš awarded the Otto Wichterle Award for young researchers to Dr. Ondřej Kreml, member of the Department of Evolution Differential Equations. The award has been established in 2002 to encourage and support young promising researchers in institutes of the Academy of Sciences. It is connected with a financial premium in the subsequent three years. 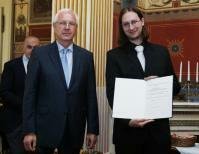 Ondřej Kreml is one of 21 young researches in the Academy awarded the Award this year. The activity aims to bring together researchers from algebra, geometry and physics that are working on related and interlinked problems albeit so far in their own respective languages. Institute of Information Theory and Automation CAS, Institute of Computer Science CAS and Institute of Mathematics CAS organize an interdisciplinary workshop with the aim to discuss about the productive power of mathematics in real world applications. Experts from economically active companies, universities, and specialized research institutions will share their positive and negative experience about how mathematics has been, can be, ought to be, and should not be used to enhance social and economic progress in the 21th century. Special attention will be paid to examples of good and bad practice in applied mathematics. The workshop will be held on 9–11 December 2015 at the Institute of Information Theory and Automation CAS in Prague. On Friday, 23rd January, 125 years had passed since the foundation of the Czech Academy of Emperor Franz Josef I for Sciences, Literature and Art (ČAVU), the predecessor of today’s the Czech Academy of Sciences. This significant jubilee will be commemorated by the Czech Academy of Sciences with several ceremonial events, exhibitions and lectures throughout 2015 - see the attached schedule of events (in Czech). Tradiční Dny otevřených dveří v Matematickém ústavu AV ČR jsou součástí Týdne vědy a techniky Akademie věd ČR, nejrozsáhlejšího vědeckého festivalu v České republice pořádaného Akademií věd ČR ve spolupráci s dalšími institucemi ve dnech 1.–15. listopadu 2015. Široká veřejnost a především studenti středních škol mají možnost nahlédnout do pracoven, laboratoří a knihoven a poznat, jak se dělá věda. Badatelé z výzkumných pracovišť AV ČR připravují širokou nabídku exkurzí, přednášek, výstav a diskusních večerů, ve kterých představují své výzkumné projekty, předvádějí nejmodernější vědecké přístroje a experimenty a přibližují návštěvníkům nejnovější trendy v oblasti vědy. V Matematickém ústavu AV ČR se Dny otevřených dveří uskuteční na pražském pracovišti ve dnech 4.–6. listopadu 2015, v brněnské pobočce 11. listopadu 2015. Traditional Open Houses in the Institute of Mathematics CAS will be held as part of the Week of Science and Technology, the most extensive scientific festival in the Czech Republic, organized by the Czech Academy of Sciences in cooperation with other institutions from 1st to 15th November 2015. The scientists from the research workplaces of the Academy of Sciences prepare a wide offer of lectures, presentations, panel discussions, seminars, excursions, exhibitions and discussion evenings, in which they present their research projects, the most modern scientific apparatuses and outline for the attendees the latest trends in the areas of science in the Czech Republic and the world. The Prague departments in the Institute of Mathematics will be open to public from 4th to 6th November 2015, the Brno branch on 11th November 2015. Professors Ivo Babuška, Milan Práger, and Emil Vitásek are renowned experts in numerical analysis and computational methods. Their fruitful scientific careers started in Prague, in the Institute of Mathematics of the Czechoslovak Academy of Sciences (now Czech Academy of Sciences). They collaborated there on various projects including the computational analysis of the construction technology for the gravitational Orlík Dam on the Vltava River in Bohemia (1956-1959). In 1966 they published their joint book entitled Numerical Processes in Differential Equations, one of the first books concerned with round-off errors and numerical stability. Ivo Babuška left Czechoslovakia in 1968 and works in the U.S.A. It is an honor for the Institute of Mathematics to host a conference on the occasion of their birthdays. A one year postdoctoral position is available within the framework of the European Research Council Advanced Grant Feasibility, logic and randomness in computational complexity (FEALORA) under the direction of Prof. Pavel Pudlák, starting on 1st December 2015. The Equadiff conferences are a series of international meetings devoted to the field of differential equations in the broadest sense. On July 6–10, 2015, hosted by Université Claude Bernard Lyon 1 at the heart of the second largest urban area of France, Equadiff 2015 continues the tradition of the Equadiff series. 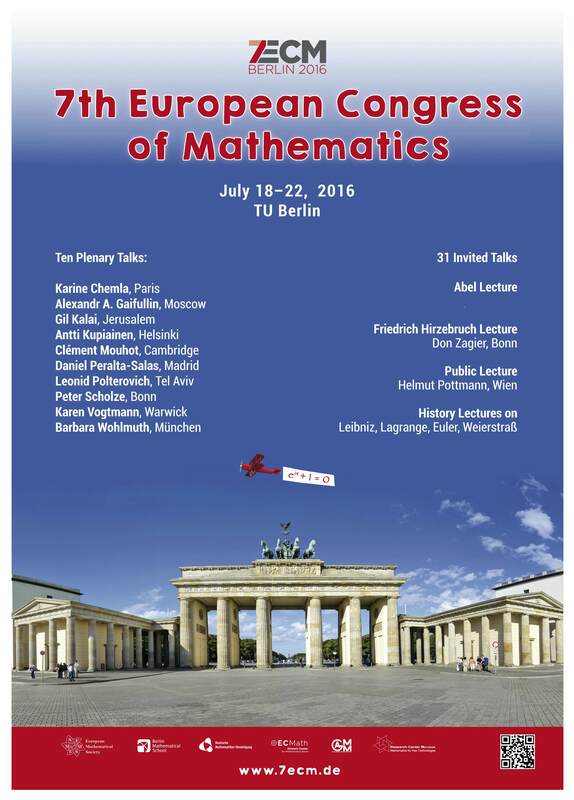 International Mathematical Summer School coordinated by E. Rocca (Università di Milano and WIAS Berlin) and E. Feireisl (IM CAS Praha). Courses given by: J. Ball (Oxford), C. M. Dafermos (Brown University), E. Feireisl (IM CAS Praha), F. Otto (Max Planck Institute, Leipzig). A three-year postdoctoral position is available within the framework of the European Research Council Advanced Grant Mathematical Thermodynamics of Fluids (MATHEF) under the direction of Prof. Eduard Feireisl, starting on 1st May 2015. A two-year postdoctoral position within the Academic Human Resource Programme of the Academy of Sciences of the Czech Republic is available in one of the research teams in the Institute of Mathematics in Prague or in Brno, starting on 1st July 2015.